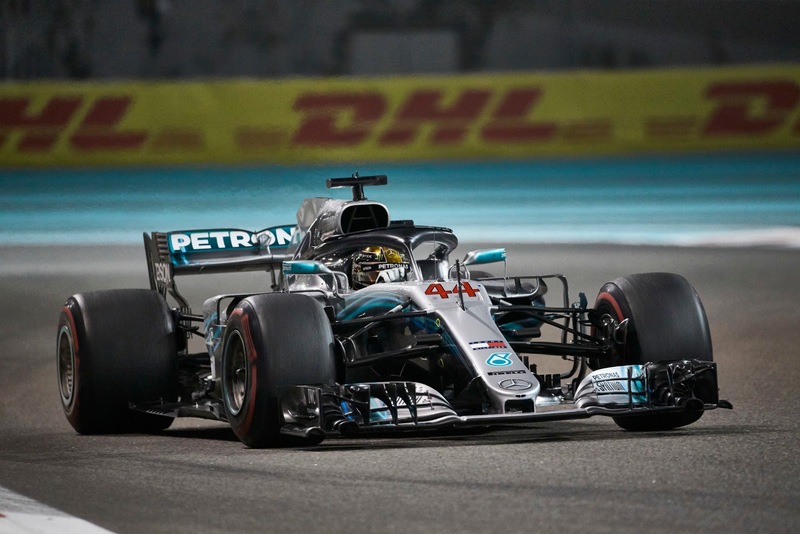 The crushing heat that enveloped the paddock in the late afternoon at the 2018 Etihad Airways Abu Dhabi Grand Prix was shimmering away as the sun dipped towards the horizon, the lights were illuminated to fight the coming darkness and the race start approached. A last minute pneumatic top up for Carlos Sainz led the list of things that happened to be concerned about, along with a quick check of Hamilton's wiring, after changing out his Energy Store the previous evening, with no penalty as they were already in his pool of parts. Lights Out!!!! Great start from Hamilton, with Bottas slotting into P2 as they entered the first turn. It was Leclerc with a fantastic launch, though, by Grosjean and dicing with Ricciardo down the long straight to T8. DISASTER for Verstappen, as he was down to P10, as it looked as if he was having some kind of massive PU issue off the line with his rain light flashing, indicating harvesting as he was on maximum throttle, shades of Rosberg in Barcelona. This ultimately left him trying desperately trying to get back round Ocon, so not at all to plan at all to plan for Red Bull. And then, just like that, Hulkenberg was upside down and into the wall on the outside of T8. He had been having a go at Grosjean into T7 and going into T8 his rear ran over Grosjean's front launching him into a series of barrel rolls. On the radio, on being asked how he was, he replied "I'm hanging here like a cow". That moment of levity disappeared rapidly as the car then caught on fire, but with the marshals on scene it was rapidly extinguished and the car righted, as Hulkenberg was unable to extricate himself whilst it was upside down against the barriers. Post-race he himself was unsure after the fact whether the halo indeed had prevented his escape, sure to be seized on by the nay-sayers as grist for their mill. Naturally, this incident brought out the Safety Car as well as an investigation into the contact and in no particular order, Hartley, Perez, Sainz, Ericsson, Gasly Alonso Stroll Magnussen, Vandoorne and Sirotkin all took advantage to rejigger their strategy... As they filtered through the pits, the stewards announced no further action on the Grosjean/Hulkenberg incident and the teams prepared to resume racing. Lap 8 and the VSC ended, just as Bottas, now leader on the track, was on his way to T18. Hamilton was just 9 seconds back and was told by the team that he was headed to the end, 10 or so seconds to the good with his stop, but a long, long stint to go. Verstappen heard from Red Bull that he had suffered from unanticipated PU protections, hampering the start of his race. The fact that Leclerc and Grosjean pitted removed the midfielders from Verstappen's race, and that now posed a problem for Hamilton, who, stuck behind Verstappen needed a quick pass to get his race on track. He was able to get round fairly quickly but Verstappen was able to grab his slipstream and on the next straight was by and scampered off on his Hypers with an apparently sorted engine, and perhaps some foreshadowing for next season to boot. 2 laps later and Verstappen was well on his way, with Hamilton's race reduced to save the tyres and stay in the window, job on point for the moment, 9 seconds back but he was already on the radio saying he didn't think the tyres would last. Lap 13 and Sainz was doing the job on Ericsson, which after a robust defense from Ericsson finally fell the way of the Spaniard for P8. At the sharp end, Verstappen was just edging into the pit window of Ricciardo, and Bottas was closing in on Hamilton, at about 0.8 second per lap and 8 seconds between them. Rain reported in the downtown area, just for fun. That didn't last long, with Hamilton upping his pace and everyone around 1:44 a lap with 34 laps to go. Danny Ricky was happy with his tyres and off into the desert night they raced, bets placed and strategies set, the only question being what tyres the Aussie would get when he finally was in for his stop. The following lap and Verstappen was now inside 20 seconds on Ricciardo, and it was Leclerc, who looked to be virtual leader of formula B in P11 and inside the pit window of Perez who led on track, albeit yet to stop for his second set of tyres. A few drops of rain sprinkled around the track and Ocon, who had been stuck at the back, finally got round Hartley and Sirotkin, with the effect that McLaren wanted to extend Alonso's stint to take advantage of his difficulties. Lap 31 and Perez was on the gearbox of Leclerc, but the action was further back, as Vandoorne, Ocon and Grosjean went 3 wide into T9, with Vandoorne coming off best and Ro-Gro forced to bunny hop the kerbs and back into P13. Ocon kept up the battle, and was by Vandoorne, although he ran off the track and seemed like a return of that spot would be called for. Or not, as there was no effort made and then it was Rogro, also by Vandoorne who had yet to stop and off in pursuit of Ocon, who had nothing at all to lose in his last race. Vettel and Verstappen had both lifted their pace into the upper 1:42's on the same lap, and then Hamilton responded, matching their pace. But looking at the times, it was Ricciardo who was making the most ground, as he was running in the 1:41's, tearing massive chunks of time out of the lead, 2 seconds back of Verstappen but with the race lead firmly in mind. Bottas, it transpired, was boxed due to concerns about the right rear, post Verstappen contact according to Mercedes. Sainz had managed to get round Leclerc during all the drama and was now leading Formula B by nearly 10 seconds. Sainz led home Formula B, followed by Leclerc, setting the stage for an interesting next season at Ferrari as the merry go round of driver change prepared to sweep through the paddock. Alonso rolled around, and then in triple unison, he, Hamilton and Vettel AGAIN engaged in making some donuts, at the urging of his team. Verstappen's podium meant he officially overtook Bottas for P4 in the WDC, and with his strong finish, Sainz overtook both his idol Alonso and Ocon, going P10 in his final race with Renault. Leclerc managed to overtake Grosjean for P13, since we're being comprehensive and that was that for the driver's side. As expected, no movement on the Constructor's side of the chart and with that, after a brief moment of sentimental radio calls that was decidedly won by Ricciardo's response to his engineer, it was off to the season of whispers, rumours, inference and everyone's favourite, bare-assed speculation as everyone's most wonderful time of the year rolled around, the time of endless argument with no available data..... Thanks for stopping by, as always, and have a great off season!! !